FV Player VAST is a FV Player addon which allows use of VAST (Digital Video Ad Serving Template) and VPAID (Digital Video Player-Ad Interface Definition) ads. If you do not have our add-on yet you can purchase it here. First thing you have to do after the purchase is to download and install the plugin. You can start with entering the name of your domain to the respective field in the My Orders section on Foliovision.com. Aftre you do that, the system will generate a unique license key and you will be able to download your copy of FV Player VAST. After downloading the plugin in a zip file, open your WP Admin and go to Plugins > Add New > Upload Plugin and choose the zip file. FV Player VAST is a separate plugin and has it's own settings, so after it's installed you should follow the steps below. Go to Settings > FV Player VAST. 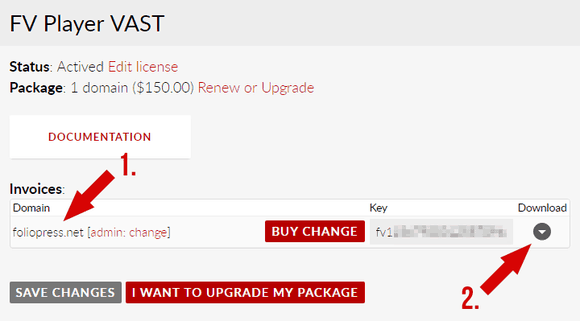 Here you can enter your license number (the one that can be found in My Orders section). If your ad network requires dynamic parameters you can click URL tags to get a hint. Your ad network uses these parameters to optimize the ad delivery. You can find comprehensive guide to URL tags in here. 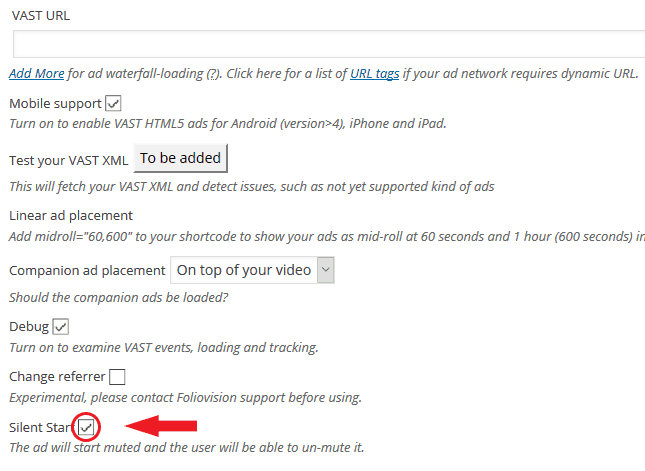 Insert your ad tag to the VAST URL field in Settings > FV Player VAST. Make sure your REPLACE tags are replaced with the right URL tags. That means that if your URL contains REPLACE_ME or [video_id_goes_here] you need to put in the required URL tag. You can use multiple VAST tags for "waterfall" loading of the ads (in case one ad fails another one will load). You simply enter different VAST URLs. In case the first one is empty it automatically checks for you the next one and so on. To enter more VAST URLs simply click on Add More and a new line to enter URL appears. You can specify a different VAST URL on a per-video basis. You can either use the shortcode editor or add a parameter to the shortcode manually. Using the shortcode editor is easy, just open it and switch to the Options tab. There you will find a field called VAST URL. Paste your ad tag there and click on the Update button. For linear ad placement, you can use the mid-roll parameter both in the shortcode editor, or manually in the shortcode. The mid-roll command allows you to specify the exact second in which the ad should start during the video playback. If you add value '0', the ad will start as pre-roll. If you use the last second of your video, the ad will play as post-roll. You can also use it for playing one ad multiple times with one video. midroll="60,300" - the ad will load in 60th second and in 5th minute. To use it in the shortcode editor, just type the time in seconds into the VAST Midroll field, that is under the Options tab. If you turn on the Silent Start option, all ads on your site will start muted by default and user will be able to activate them by clicking on the sound icon, that will appear after hovering over the video window. To activate it, go to Settings -> FV Player VAST and check the box Silent Start at the bottom. Debugging will offer you a tool that enables you to monitor the execution of the program. You can examine VAST events, loading and tracking. If it's not enabled, then you can't see what FV Player VAST is "thinking" it is doing. You can turn on debug option in Settings > FV Player Vast > scroll down to Debug and tick the box. Additionally you have an option to effectively use your ad network stats. For example, they should check for you fill rate and other stats. You can also use Google Analytics to track your ads - more about that in the guide Tracking VAST and VPAID Ads With Google Analytics.